I’m here to discuss one of the most important components of a trailer setup, which is the weight distributing hitch. Usually, when you buy a travel trailer, the sales agent would also mention your need for a weight distributing hitch, saying it is effective for sway control. But if you’re someone who is not familiar with the technical aspect of RVing, you either dismiss his pitch, thinking it’s just another way to oversell their products, or you’ll just lap it up even without much understanding. In this instance, however, you really should take his advice and get one as well. But then you must first know what a weight distributing hitch is. Maybe you’ve heard about nerve-wracking experiences of several trailer owners, during which their trailer started swaying from left to right while driving. To avoid this scenario, you need to manage your trailer’s weight distribution, most especially if it is heavy with a load. Commonly referred to like the trailer equalizer, a weight distributing hitch assists in distributing the downward forces of your trailer, which equal to the tongue weight, across the axles of both your towing vehicle and the trailer. Without it, you will possibly encounter problems controlling your vehicle. You see, if your trailer has a lot of tongue weight relative to its overall weight, it can cause your hitch to dive. That means, the front side of your trailer will be brought to the ground, and the front of your towing car will flip upwards. It’s not good to have a light tongue weight either as it will send your trailer flailing. A weight distributing hitch helps avert such compromising situations by managing the steering and braking functions of your vehicle, keeping them safe and under control. In this article, I would like to present you more about this vital part of a trailer and provide you with different options in the market, with at least one that will suit your vehicle and your needs. Do all Travel Trailers Require a Weight Distributing Hitch? Can You Always Count on Your Dealer? How do You Choose the Appropriate Rating for Your Weight Distributing Hitch? If your trailer is generally looking at a lighter load, you can manage with just a weight carrying hitch. Unless you are consistent with this type of usage, a weight distributing hitch, however, seems a good default option because you never know when you will need to carry more. As a rule of thumb, if the gross weight of your trailer is equal to, or more than half of the weight of your towing vehicle, without a doubt, you’ll need a weight distributing hitch. In any case, the law would require anyone whose trailer weights reach a certain number to have a weight distribution setup. Moreover, there are trailer and towing vehicle pairings that automatically require this type of hitch. You must note that a weight distributing hitch is not only to control a dangerously flailing trailer or towing vehicle, but also to make handling of the driver much easier. Imagine if you are always fighting off strong winds just to prevent your trailer from swaying, giving it all your might as you navigate your way to your destination. This can be physically taxing, not to mention being stressful and alarming for everybody riding the vehicle. Aside from windy atmospheres, big trucks and downhill paths can also cause your trailer to veer off from its otherwise steady path, that is, when you don’t have a weight distributing hitch in place. Another scary scenario would be the rear side of your towing vehicle dropping so low such that, its front side, where the driver is, is practically raised from the ground. You lose grip of your brakes and maneuverability, which can lead to very dangerous consequences. A weight distributing hitch will maintain the balance between your vehicle’s front and rear axles to keep it leveled and stable. Then there are general requirements of tow vehicles for specific gross trailer weights (GTW), which comprise the total weight, including contents, fuel, and everything inside. Car manufacturers such as Toyota, stipulate a weight distributing hitch for trailers that have a GTW of 5000 pounds. For a heavier tongue weight, Chevrolet Silverado 1500 entails this hitch type as well. It’s very crucial to always refer to the vehicle manual whenever you are planning to use a travel trailer with it to avoid untoward incidents. When you invest in a weight distributing hitch, it’s always safe to go for the one that provides sway control. Mind you, not all hitches are equipped with an anti-sway mechanism. This way, your driving will be more relaxed, which would otherwise be precarious if your trailer is swaying from side to side on the road, compromising the vehicle, its occupants and the trailer itself. Just like anything, there are various options for weight distributing hitches. Many companies will promise you the moon and the stars, saying their product is a better option than the competition. I’ve picked the top 3 mentioned above based on their sway control capabilities, which I think is one of the most important considerations when buying a weight distributing hitch. As such, I did not include a product that does not have this feature. But for those hitches that make use of bars as sway control, I excluded them as well because, in my opinion, it does not constitute a real mechanism for sway control. Based on the sequence of my picks, I placed the Andersen ‘No-Sway’ weight distributing hitch in the topmost spot. Why? Simply because it is the best of them all. It uses a different weight distribution principle, unlike the traditional spring arms that exist in the majority of the weight distributing hitches. As you read on, you will get to know more details about our best weight distributing hitches, including the runner-ups. This way, you’ll know which one suits your trailer best. The Andersen ‘No-Sway’ weight distributing hitch does not use solid bars in sway control. Instead, it has chains that connect to brackets that make it weigh at only 60 pounds. Even if it’s lightweight, it can accommodate a high gross trailer weight of up to 14,000 pounds and a tongue weight of 1,400 pounds. And impressively, its performance at these weights is excellent. This type of hitch does not have a squeaking noise, which can be rather distracting. In fact, you’ll never have to worry about having a bounce effect while in use. This is reduced by its true motion system. As such, it is quiet as a mouse and makes for a smooth ride. Amazingly, there is no need to lubricate the hitch, so no more accidental grease stains on your shirt to agonize over. The Andersen ‘No-Sway’ is easy to install with its simple chain design. It saves a lot of hassle compared to dealing with grease-filled bars. Moreover, you can choose to skip on the weight distributing hitch and use the ball mount that comes with it instead. This way, you won’t require an additional towing component for lighter loads. Truth be told, I cannot find any disadvantage of this product. It is an ideal option for most travel trailers the provides a no-hassle approach to sway control. It is common for other weight distributing hitches that have the typical spring design with brackets to require their detachment when driving in reverse, or during inclement weather. Not for this hitch. However, there are a few exceptions, one of which is when backing up involves two different level positions. As an example, you’ll need to disconnect when you need to move backward on an incline, coming from an even plane. The Trunnion type of spring arms serves a number of purposes. First, these spring arms give more ground clearance than spring arms with a round bar. They also aid in sway control using a 4-point system in order to provide the highest resistance to swinging. The traditional, time-tested spring bar is best represented by this hitch. In fact, the company has been engaged in manufacturing this product for many decades. This alone proves that their spring bar hitches such as the Equal-i-zer, have towed countless travel trailers since. The noise levels consisting of creaks and grinds, are brought about by the metal friction from the hitch’s L brackets and spring arms when you make turns, or drive through road bumps. Although the company recommends getting a sway bracket jacket, which has its own setbacks, unfortunately, the clanking sound is just something you have to accept this type of hitch. The contact area cannot be lubricated with grease as the anti-sway capabilities will be affected. A lubricant application is done once every season is required on the sockets of the hitch. This will provide protection and maintain its smooth functionality. Installing the Equal-i-zer hitch can be quite confusing. You need to test several combinations of L brackets and washers, which work the hitch head before you determine the appropriate weight distribution framework. Figuring this out is a bit time-consuming. Springs bars must also be stored when the trailer is not in use. Even when you can get this hitch with a kit, you will still have to buy a separate hitch ball, making sure to pick the right size for your trailer. This would either be a 2-inch ball or slightly bigger, which is usually stamped on your trailer’s coupler. The Equal-i-zer hitch's weight distributing design effectively transfers trailer tongue weight to all the axles and helps keep the front of the tow vehicle firmly on the road. Part of the company’s budget weight distribution line, the Fastway e2 is quite affordable with its round bar spring arms and 2-point sway control. This, however, comes with lesser ground clearance. In any case, you can opt for trunnion arms that will provide more ground length because its attachment doesn’t drop down as much by design. Comparing to a basic ball mount that has zero anti sway properties, this type of hitch offers a simple weight distribution mechanism enough to prevent your trailer from dangerous swinging. And just like its more expensive option the Equal-i-zer, you can back up and brave bad weather without disconnecting it from the tow vehicle. The Fastway e2 has the setbacks of the Equal-i-zer such as the distracting noises, the need for a separate hitch ball purchase, bar storage for inactivity, and confusing install procedures. Aside from that, this being a cheaper option, expect it to have limited features including the 2-point sway control. But what’s important is that it delivers the basic functions a trailer can get by with, which any budget-conscious buyer will appreciate. If you can cough up more budget for a product that promises to prevent swaying at all costs, then you should check out the Hensley hitch. You may have noticed that my top picks consisted of hitches that rely on friction to mitigate the swaying action. In other words, there will still be some swaying going on, but less dangerously so. So this Hensley hitch will actually cost you an arm and a leg at around two thousand five hundred Benjamins! Expensive it is, but it has its share of “rich” believers. Even Marshall of Camp Addict, who is also a member of the Hensley Club that caters to owners of lighter trailers with a maximum gross weight of 6000 pounds, is sold by its price and features. The Hensley hitch is as heavy as it is pricey. In effect, this extra weight adds to the tongue weight, which should be considered before buying this hitch, especially those who don’t want additional weight on their trailer as it is. Hensley Manufacturing was the original maker of this hitch hence eponymously named. However, there’s another company named Pro Pride Inc., who does the same type of hitch, only better, or so they claim. Both are premium hitch manufacturers, each having a very similar product quality, so the jury is still out on which one is better. The hitch is not the be-all and end-all of your trailer’s weight distribution systems. As they say, it takes a village to make it all work, with the help of supplemental components or accessories that level up your trailer use. Don’t get me wrong though, your hitch may be sufficient for your towing needs. These add-on conveniences are not mandatory at all. However, they can complement your trailer in more ways than one. Make your trailer more secure with a hitch lock, which is inserted in a hole on the side of the receiver tube. This would hold the ball mount in place. Usually, your hitch can slide out from its mounting position without a layer of security. By placing a hitch lock with a pin, you prevent theft of your entire hitch, much like placing a padlock on your gate to deter unauthorized entry. This may not be a surefire way to avoid stealing your hitch, but it will surely make it difficult for the thief to unlock it and take the item. This can be worth buying to give you a little peace of mind. Dust particles and dirt can get to the mobile parts of your trailer, especially on the portion of the coupler and hitch ball. And besides, the movements themselves during turns and driving over rough terrain can eventually cause friction and breakage. Keeping these components lubricated prior to a long road trip can maintain smooth joints and axles. Most weight distributing hitches call for lubrication, except the Andersen No-Sway weight distributing hitch, which is another reason why it is our top choice. Meanwhile, grease also prevents rusting, so if your hitch requires this, apply it regularly to the winch, trailer bearings, coupler, or anything that moves in operation. Often you will find that the nut slides easily in the receiver tube of your trailer hitch. A hitch stabilizer will tighten the bolt through the nut and insert, pulling the ball mount towards the receiver part, which will secure it in its location. Without a hitch stabilizer, the loose fit in the receiver will wear down and affect your shank in the process. What’s worse, the clanking sound it will produce as a result. Not only is the noise diminished, but this anti-rattling tool prolongs the lifespan of your hitch and its related components. The StowAway Hitch Tightener made in industrial stainless steel material prevents wobble, locking your nuts in place. Safety chains are connected to the tow vehicle to guide your trailer and maintain control in case your coupler fails. Often, these hang low from their position, getting dragged on the road at every turn. To avoid this, a safety chain hanger is recommended. This seemingly unimportant piece yet with a crucial benefit is made in plastic that supports your safety chains. It comes in 2 different sizes that fit a Class 3 or 5 hitches. You might wonder if this hanger does not get in the way of the safety chains. After all, these chains must not be fastened to any hitch component that does not have loops or holes, otherwise, it can result in a mishap. With actual use, the chains will not be hampered by the hanger, which would be released in case the safety chains themselves get stretched along the way. Many RV owners realize the usefulness of the safety chain hanger that you will find it in numerous trailers nowadays. Remember that some weight distributing hitches require their bars to be stored when they are not being used. Instead of being squeezed inside your storage, which can be a messy affair with all its greasy material, you can get an Ez Store hitch to serve this purpose. The EZ store hitch is your dedicated storage space that can be installed clamp style on the front side of your trailer for your weight distributing hitch. It can accommodate any weight distributing hitch bar, may it be the Trunnion type, flat, round, Blue Ox or other types. By simply sliding your spring bars onto the tray and using a hitch pin to lock it securely, you are able to save storage in your trailer. Please note that you can also stow your weight distributing hitch itself in the EZ Store Hitch when your trailer is not attached to your vehicle. This way, you can always avoid falling victim to a hitch thief. No more breaking your back, the Hitchgrip makes it easy to install, detach and carry your weight distributing hitch. Made with heavy-duty resin, it is lightweight and catered to work with any hitch that has more than 2 inches of hitch balls and standard shanks. It is designed to distribute the weight of your hitch load for better handling. The Hitchgrip can slide your ball mount in an out of your hitch receiver. 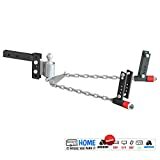 It does not only make lifting your hitch practically a breeze, but you also don’t have to literally get down and dirty by carrying the greasy hitch with your bare hands. It makes for a mess-free activity for an otherwise cumbersome task. Locking mechanisms are essential to RVing because there will always be unscrupulous individuals who will target valuable trailer components, especially those that are not secure. A trailer that’s parked outside is vulnerable to such occurrences. And sometimes, a pin and a latch are not sufficient to guarantee your trailer’s security. There are several coupler locks being sold, but most of them can still be broken by smashing it with a crowbar or sawing into it. While this could be a luxury, the Coupler Vault Pro is super durable, it can fit both 2-inch and 2 5/16-inch couplers. Even with an undone latch, it provides an extra layer of security with its adjustable ball that fits into the socket. Furthermore, the interlocking plates make it very difficult for any thief to break the lock. There are many of us who buy things such as a travel trailer, yet we don’t know to have enough understanding of the technical aspects, which would have better equipped us by knowing the right specs to buy. All the more when it comes to buying weight distributing hitches, we often find ourselves relying on our trailer sales agent to decide for our purchase. You’d probably think that these salespeople care about us enough, and whatever they say must be good. After all, they are well-versed about the products they sell. Is that safe to say so? Unfortunately, this is not the case for many people. I must say though that there are still competent dealers of these travel trailers who really know their stuff, and will not hesitate to help a customer get his money’s worth. With any advice they give however, you should always take it with a grain of salt and exercise due diligence by doing your own research. There are a number of reviews that offer valuable info on the internet, which you can glean from in order to make an informed decision. When it comes to weight distributing hitches, they may seem Greek to you at first. In fact, even the sales agent who is trying to upsell you with all the bells and whistles your trailer will benefit from doesn’t know jack about the product itself. My laziness got the better of me when I bought a Fastway E2 hitch from the dealer of my trailer. I completely trusted my sales agent thinking he was the rightful person to give purchase suggestions to buyers like me. And since I bought the travel trailer from their dealership, they must know my trailer’s gross and tongue weight, and how to take care of the installation. Little did I know that I will be screwed big time. If you must know, the Fastway brand of weight distributing hitches suit trailers with gross weights starting from 4500 lbs up to 10000 lbs. As such, you should get a hitch rating equivalent to your trailer’s actual load when in use and not only on its max weight listed on the trailer’s manual. Based on my usage, my trailer usually weighs in at less than 5000 pounds. What happened was, my agent gave me a hitch rating of ten thousand pounds, which is overkilling it. As a result, towing the trailer was rather rough, and I had to contend with the big spring arms that came with that hitch rating. And to make matters even worse, the brackets were installed incorrectly, creating a substantial space between the hitch frame and bracket bolt. This gap was a disaster waiting to happen because it can cause the brackets to cave in as the bolts are tightened according to its torque. This is exactly what came out of the brackets of my trailer after some time. They have become distorted with their dip. I ended up replacing them with new ones as recommended by a fellow trailer owner who had a similar experience using the Fastway e2. In my case, the Fastway e2 brackets are dangerously drooping from their position. I would say though that has more to do with a design flaw than being an improper install. There’s not much allowance for a ground clearance given how it was set up on my trailer. As a result, the brackets were always touching the road when my trailer has to take a dip, say joining the road from a gasoline station’s elevated ground. It was collecting a lot of ground dirt in the process as well. As such, it dented the brackets whenever I towed my trailer. All that just because I carelessly let a dealer take over my better judgment, and blindly accepted the erroneous installation of the weight distributing hitch on my personal trailer. In hindsight, all the problems I have encountered then would have been averted if I’ve gotten to know about the Andersen No-Sway weight distributing hitch sooner. And the reason why I’ve been raving about it from the start is that I had it installed on my RV many months ago. I’ve personally experienced how durable and efficient it was at handling my trailer. And I haven’t looked back since. Before I finally got a hold of the Andersen No-sway hitch, I had my Fastway e2 hitch fixed. It took considerable time to finally get it right, referring to the manual’s procedures. At that point, I used a new set of brackets as the ones in place were no good anymore. Consequently, there was more ground clearance from the spring bars. The trailer was more leveled unlike before when the brackets were always kissing the ground it went by. In spite of the marked improvement, now that there is a nice gap between the brackets and the ground, I felt it can still do better. Especially when I discovered how tedious it was to connect and disconnect the hitch. There were times that the L brackets would loosen up and cause the bar to detach from the brackets. Actually, this would happen regularly and as I said, it all comes down to the product design. Now that I’m using the Andersen hitch, I’ve had none of these problems, and this type of hitch is highly recommended to anyone with a travel trailer. You must know that weight distributing hitches are not exclusive to typical travel trailers only, they apply to any trailer that can be towed such as tiny houses, boat trailers, or even horse trailers. A car, or any vehicle on its own, will not require a hitch given that it’s already designed to distribute weight evenly. Since you are connecting a trailer, whose motion will be dependent on your motor vehicle, it is important to spread the tongue weight from the axles of both the trailer and tow vehicle, with the help of a weight distributing hitch. Without this weight distribution system, the steering function of your towing vehicle, as well as its braking capabilities, will be adversely affected. You can see in the first photo above how your trailer drops down on its front side, while your towing vehicle is lowered on its rear. In the second photo, you will see how leveled both your tow vehicle and trailer are parallel to the ground, with a weight distributing hitch in place. When there is no hitch to spread the weight, your tow vehicle’s front axles are raised, losing touch of the ground beneath. This will compromise any steering and braking action, which can lead to catastrophic repercussions. When you step on the brakes, it will take more distance before it takes effect, and will cause you to potentially lose control of the steering wheel. Imagine what will happen if your trailer is loaded with cargo and all of it drops in the middle of the highway. Quite terrifying, is it? You will find a video below that shows you the important role of weight distributing hitches in ensuring you maintain your vehicle’s braking and handling. There are two weight ratings being followed when you decide on a weight distribution system for your travel trailer. One is the gross trailer weight, the other would be the tongue weight. Gross trailer weight or GTW pertains to the total weight of your trailer, including the cargo. You can determine the GTW by using a vehicle scale. Tongue weight, on the other hand, is comprised of 10 up to 15 percent of your trailer’s GTW, plus the rear cargo weight of your tow vehicle. This is a determining factor for your weight distributing hitch. If you choose to get a hitch that is rated too high, you will experience a rougher and bouncier ride. This can also cause your hitch parts to wear out in advance. Simply put, a high rating is directly proportional to the weight of your trailer. You will also have to contend with the heavy weight of the spring bar-type of hitches when you really don’t have to. If you use a lower rating than what suits your vehicle, there will be no proper distribution of weight, making your hitch practically useless. When you want an easier setup, I always suggest going for the Andersen weight distributing hitch. Each kit has a hitch ball and a receiver that can suit different ratings. Plus, it uses chains instead of spring bars that can be difficult to deal with. Generally, spring arms are used with a weight distributing hitch to spread the tongue weight evenly by moving some of it to the axle on the front of your tow vehicle. While chains are also used, I will focus on the lift brackets instead because they have an inherent anti sway functionality that is more preferred. Lift brackets are mounted on your trailer’s frame, which holds the spring bars. Traditional ones have a snap up design where the number of chain links affects the tension between each spring bar. There’s also a blue ox type of rotating latch bracket, which uses a spinning mechanism on the bracket to tighten the chain. For this type, the bars are inserted in the weight distribution head from the back, which makes for a streamlined design. Basically, these are not exactly more effective in terms of its weight distribution. However, it provides better ground clearance. These square-shaped arms along with the trunnion hitch kit will be more expensive than the round bar type. These attachments slide into the head while clipped to hold it in place. There is a slight curve that limits its ground clearance. This is something that should be factored in when buying a hitch, especially if you already have a low trailer, to begin with. Below is a checklist of towing components you need (aside from the tow vehicle and trailer, of course) regardless if you have a weight distributing hitch or not. This may come with a trailer hitch, which will ensure the load and passengers are safe and secure in the trailer. The size is important because it has to connect with the coupler. The hitch ball has to be lightly greased, with the coupler completely locked on it. This is part of the frame which should match the tongue weight. Often, it has holes for bolts to be inserted. These chains safely guide your trailer and provide control upon reaching a stopping point. This connects to your tow vehicle’s electrical system, which is responsible for your lights and brakes. A receptacle houses the cable plug, which will provide an interconnection between the trailer and the dolly. Hitch receivers vary in terms of the weight they can accommodate. They come in five different classes starting from 1 to 5. You will find the class your vehicle belongs to, in your owner’s manual. Vehicles classified under 1 and 2 don’t usually require a weight distributing hitch given the overall low weight. But those that fall in the 3 to 5 classes should have a weight distributing hitch. In any case, you should always refer to your owner’s manual to know your weight distribution requirements. So, is your car capable of hauling that trailer? Talk about a weighty issue. Yes, it all boils down to the weights your vehicle can handle plus a few factors. Your car can tow an RV depending on its Gross Vehicle Weight Rating or GVWR. This is the highest weight your vehicle can tow, but usually, you would like to go only at about eighty percent of that figure. For example, if your pickup truck has a GVWR of 10,000 pounds, you’ll get a trailer that has a GTW of 8,000 pounds. These specs are usually visible on your manual under the towing capacity section. Or you can check out the website of the manufacturer to get these details. Going over the limit is never a good idea. Doing this will stress your car’s engine, brakes, and transmission. Smaller cars may not be able to tow at all for obvious reasons, but you can always check the corresponding towing capacity (if any). A newly bought trailer will have its own weight versus one that has an actual load which needs to be factored in to be towed by your vehicle. This additional load may include your food, RV appliances, and passengers. It’s therefore essential to know how much your trailer weighs including the cargo, which is the gross trailer weight. Knowing how much your trailer weighs is vital so you don’t go overboard, and you can be assured that your vehicle will be able to tow it safely. And with that information, you will also need to be aware of your weight distributing hitch rating. You can’t just buy any weight distributing hitch as it should correspond to the hitch rating of your trailer. When planning for a trip, you will be bringing all sorts of cargo such as water, propane, and perhaps loads of food and clothes. All these should yield accurate weight measurements before getting an applicable weight distributing hitch. You don’t want to exaggerate your ratings as your ride will be rougher as a result. And you would also avoid getting a lower rating for your hitch. Aside from the gross trailer weight, you also have to consider the tongue weight. If you’re looking at it so simplistically, you may wonder if there is such a ginormous weighing scale you can place your heavy trailer on just to get the weight. You can rest easy because there are weighbridges or truck scales, which you can find at highway stops where you can weigh your RV for a fee. You need to know two weights which are the tongue weight and the gross trailer weight. A travel trailer’s tongue weight is the weight of the trailer when fully loaded. This exerts a downward force on your vehicle’s hitch ball. For RV experts, the tongue weight is pretty much the lever, where the axle acts as a fulcrum. A proper tongue weight affects how a trailer turns and adjusts to different road conditions without issue. You won’t have a swaying trailer if your tongue weight is balanced out. If it’s lighter, the weight will shift behind the axle. And if it is heavier, it will shift ahead of it. Apparently, there are three other ways to get the tongue weight of your trailer aside from a commercial scale. You can use a scale that’s specifically used for getting the tongue weight. This is a compact device which you can slide underneath the tongue jack of your trailer. You can also resort to a bathroom scale, but this is a little complicated. It will also involve a brick, pipes, lumber, and a bit of calculation. Then there’s a weigh safe 2-ball mount with a built-in scale. This is much easier than having your trailer be physically weighed using a weighbridge because you can instantly get the tongue weight values when it’s hooked up to any trailer. However, a weighbridge or commercial scale will not only provide you with the tongue weight of your trailer, but also its gross weight, and the gross combined vehicle weight or GCVW. The GCVW is the weight of both your trailer and your towing vehicle. You have to remember that when you weigh your trailer, it should be loaded accordingly to its regular cargo. This will provide you with an accurate measurement of your trailer weight. Apply this to your tow vehicle as well, and include passengers if need be. When you need to determine only the tongue weight of your vehicle, you will normally require 2 weigh-ins: one is for the GCVW or combined weight of your trailer and tow vehicle, the other is for the vehicle alone. You have to make an appointment with the establishment before you take your vehicle and trailer there. Advise them that you’ll need 2 weigh-ins so that the second one will be considered as a re-weighing transaction. This way, you will get a more cost-effective rate. Pack your trailer like you would when going on your usual road trips. You may load it with your camping gear, food, sleeping bags, and other items you would normally bring with you. Drive your trailer and tow vehicle to the weighing scale, making sure the axles of your tow vehicle are within the front weighing pad, while the axles of your trailer are set on another weighing pad. When you receive your weight printouts, you will find two weight amounts. You will then note the weight of the tow vehicle, which we will refer to as weight A. Step out of the scale and disconnect your travel trailer. With just the tow vehicle, proceed to the weighing scale again and position it within the weighing pad. This will be your re-weigh transaction and the value on the printout will serve as weight B. Using simple subtraction of the two weight values, this will give you your tongue weight. No complicated computations, just basic math. After we have learned about getting the tongue weight measurement via a commercial scale, and how they are among the crucial factors in towing your trailer, it’s time to relate it to the use of a weight distributing hitches. When you are considering a weight distribution system, you should note the weight of the load you will tow. For instance, if your weight distributing hitch is rated for 1000 pounds of tongue weight capacity, yet your actual value is only 300 pounds, plus the 50 pounds of cargo in your towing car, then you are about 650 pounds off your rating. As such, your weight distribution can be very arbitrary and therefore precarious. So now you need to get the tongue weight of your trailer. This time you’ll need a third value after your two weigh-ins for your vehicle tongue weight and gross weight. You can log the values on a Google spreadsheet and compute for the tongue weight of your trailer. For the third weighing, you can tag it as a re-weigh, which costs less than a separate weighing activity. You might also like 5th Wheel Hitch Installation Cost. Position your vehicle with the connected trailer, including the weight distribution system in place. Your axles need to correspond to their weigh pads as they require individual measurement. There will be three weight outputs on your weigh-in printout. While still maintaining the position on the weighbridge, you have to detach the weight distribution mechanism. Then set this as a re-weigh, and you will get another set of 3 weight values once again. Step off the scale and disconnect your travel trailer from your car. Bring back your towing vehicle to the commercial scale, and follow where the axles should correspond to which weighing pad. This, being a re-weigh, you will receive two weight values on your printout. Counting all your weighing transactions, you should have three printouts. Note which ones correspond to a type of weigh in, if it’s for the combined trailer and vehicles with a weight distribution system, etc. Encode all the values you have collected during your weigh-ins in your spreadsheet. In other words, you will subtract your tow vehicle weight from the combined weight of your vehicle and trailer. The answer will be the tongue weight of your trailer. Add the trailer’s tongue weight to the weight of your trailer, vehicle, and weight distribution system. The result becomes the tongue weight of your weight distribution. The values between the above weights should not be too far off from each other. You should keep in mind that your weight distributing hitch should not add more weight force on your front axle, and should be comparable to your vehicle being used without it. In other words, the front axle should just weigh about the same with or without a hitch, otherwise, you are defeating the purpose of spreading the weight evenly. For lighter trailers, you can use your home weighing scale plus an ordinary box to determine their tongue weight. All you have to do is to put the trailer’s coupler (at loaded capacity) on the weighing scale, observing the usual towing height by placing a cinder block underneath. Gather your home weighing scale, a brick or cinder block that has the same height as the scale, 2 steel pipes, and 4-foot wooden slab. Set up by placing your weighing scale on one side and brick on the other. Place one pipe on top of the scale and another on the brick. Put the wooden piece over the pipes and check if they are leveled. Position the trailer tongue a foot away from where the brick that supports the pipe is. Multiply the weighing scale value by the distance of the two pipes. As a sample computation, let’s say the distance of the pipe on the scale from the trailer tongue is 2 feet. On the other hand, the distance is 1 foot from the pipe above the brick towards the tongue. So if the scale reads 300 pounds, multiplied by the added distances with the equivalent of 3 feet, then the tongue weight is 900 pounds. This method of getting a heavy trailer’s tongue weight without placing the whole thing on the digital scale, which would have broken it easily with its massive weight, is very ingenious. And the cost of this undertaking, provided you have the materials already at home, is zero. If you don’t want to bother with a DIY home weighing scale method, then you can probably consider getting a tongue weight scale, which is a bit expensive for its purpose. This type can usually accommodate a maximum tongue weight of two thousand pounds, which is enough to cater to heavy travel trailers of up to 20 thousand pounds. To operate, position the tongue weight scale beneath your trailer tongue jack. Do this when it is still connected to your towing vehicle. Place the trailer on chocks and disconnect it from your vehicle. Voila, your gauge will show you the tongue weight of your towing vehicle. When your trailer is not leveled when it is attached to the vehicle, the hitch should be adjusted to keep both trailer and vehicle on an even plane, in order to apply the reading on the tongue weight scale. The weigh safe ball mount is a type of trailer hitch which provides a convenient way of measuring the tongue weight of your trailer. Just like a tongue weight scale, this weighs safe ball mount has a gauge and you can instantly hook up with any trailers. The mount can be adjusted and it also comes in different sizes. It is nice to have this handy, especially if your trailer handles varying loads. You can easily check if you are within your limits when you have this. Aside from that, it is used to tow light trailers, which normally don’t have a weight distributing hitch. But of course, it comes at a price which some may think they can do without. When you decide to go on a trip using an RV, you don’t just load it up with all the stuff you need. Aside from observing the maximum capacity of your trailer, you should also allocate your cargo by putting about 60 percent of it on the front side of the axle, and the remaining 40 percent at the rear side. Being rear heavy can be dangerous because when you encounter heavy winds during your road trip, it can cause your trailer to sway from side to side. Speaking of trailer swaying, there are two types to mitigate the situation. There is weight distributing hitches with integrated sway control, and there are those that you can acquire as an add-on purchase. While they both aim to reduce the swinging of your trailer for a smoother ride, they have marked differences in delivering this feature. You will notice that our top picks for weight distributing hitches have sway control built in their design. A separate anti-sway device Howey is constructed in bar style friction control. They even come in two types, one that reduces swaying as it happens, and the other working to prevent swaying completely. So which one is better – the integrated sway control or the separate add on device? I would say the integrated one is the best option which all the top picks for weight distributing hitch have. It also does not have the limitations of an add on anti-sway and is deemed more effective at reducing the sway if not, preventing it. The independent device works by controlling the bolts of your trailer’s frame on one end and connects to a hitch ball that is mounted on the head located at the opposite end. As it is attached to the weight distribution mechanism of your trailer and its frame, this device can deliver tension to keep your trailer in line. A bar would extend and retract with your trailer’s movement. When your trailer derails, the friction pads within the add-on device will come into contact with one another and produce resistance. This will then reduce the swaying action. Trailer compatibility – The bar style of add on devices is not suitable for trailers with a hydraulic braking system. Removal during reverse driving – In order to prevent any damage in your trailer system, you need to detach the bar-style sway control when backing up your trailer. Extra handling during inclement weather – When driving on slippery roads, may they be snow-covered, or simply wet with heavy rains, you need to adjust the handle of the device by going counterclockwise, removing all tension. Limited GTW – If your trailer weighs more than 6000 pounds, you will need 2 anti-sway devices, by placing one on each of the two sides. This will also apply when your trailer is more than 26 feet in length. This type of sway control works by fighting off the swaying as it happens. It creates resistance to prevent your trailer from going out of line. It usually relies on the downward force of hitch spring arms, which will produce friction on the brackets. The 2-point systems are suitable for trailers with hydraulic brakes and are quite easy to install. They can also stay put on your system even when you back up your vehicle. What’s more, you do not have to worry about the tightening action on the device compared to add-on sway control devices. Aside from the added two points, these systems depend on its connection with the head, where the spring bars are in place to provide enough tension. This counts for the first 2 points. The other 2 points refer to the end of the spring bars which are connected to the frame of your trailer. These also provide resistance and sufficient tension. There are those with back-up systems at play, where the anti-sway relies on friction between the spring bars and brackets to prevent the trailer from swaying. We have learned that a weight distributing hitch is a must for trailers that weigh at the very least, more than half of your towing vehicle. This product will supply you with a balanced weight displacement via redistribution of your load onto the axles of your trailer. You will appreciate this setup when you drive with your trailer in tow, as your ride will be noticeably smoother and stabler. I have presented you the top picks with integrated sway control, and at least one of them you can consider for your own trailer. Always keep in mind the crucial weights which are factored in so that you will get the most out of your chosen weight distributing hitch. Once you have it installed, you can sit back, relax, let it do its balancing act, and enjoy the ride. Great article. One major flaw though. It leaves the reader thinking that hitch storage must cost over $100 when convenient hitch and spring bar storage is available for about $30 with Hitchport. The best rv products are simple, inexpensive and functional!